Improvement varies from child to child. It also depends on what kind of surgery was done. If your child only has scar tissue removed, you may notice some improvement within a month. If your child has a nerve graft, you may see some improvement after six months. Improvement may be slow, and progress may continue for almost two years. 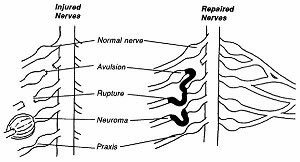 A nerve may be grafted if there is a rupture or avulsion. Sometimes the surgeon must remove a section of nerve because of scar tissue. Then, a nerve graft is used to reconnect the ends of the nerve. 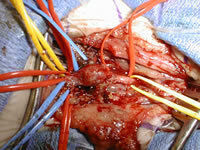 It is important to realize that brachial plexus surgery is not a miracle cure. However, for some children it is the best way to regain nerve control. There are times when nerve surgery is not recommended or is not successful . In these instances, the team may recommend surgery to transfer muscles and tendons. This type of surgery can give a child better functional use of the arm and hand.